CLEAN TITLE CERTIFIED! Clean one owner, no accidents! This vehicle is at 205 E. State Pleasant Grove, UT 84062. 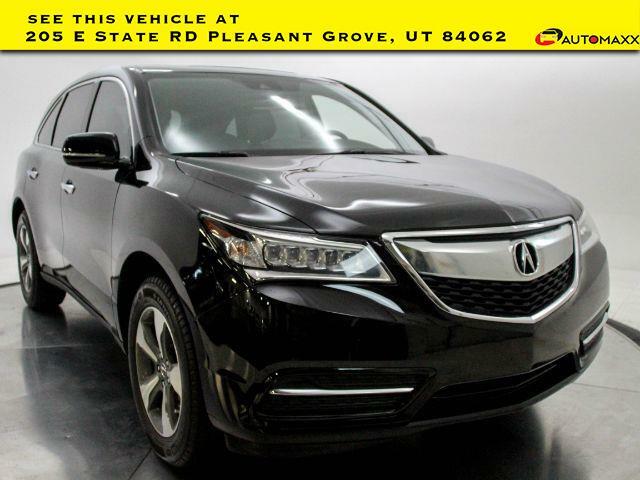 Crystal Black Pearl 2016 Acura MDX 3.5L FWD. We have finance options for all credit solutions! So many standard features is doesnt seem fare to the other 7 passenger vehicles on the road! Including intelligent cruise control will react to avoid front collisions. Even if you dont. Blind spot warning and intervention, just to name a few. A must see!! Reviews: * Generous number of features for the money; adept handling; good fuel economy; confident acceleration; quiet cabin; excellent crash-test scores. Source: Edmunds * The Acura MDX is as refined as it is sophisticated. It is adorned with gorgeous Jewel Eye LED Headlights, which are designed to help improve reaction times and lessen eyestrain. With SUVs and Crossovers, keeping vehicle weight low is important. The MDX comes standard with a very generous assortment of features. Some of the items are the Multi-View Rear Camera, Anti-lock Brakes, USB iPod Integration, Vehicle Stability Assist, Bluetooth HandsFreeLink, and a Power Tailgate. Optional packages give you amazing items as well. Some of them are the Forward Collision Warning System. Awards: * 2016 KBB.com Best Buy Awards Finalist * 2016 KBB.com 5-Year Cost to Own Awards 2016 Kelley Blue Book Brand Image Awards are based on the Brand Watch(tm) study from Kelley Blue Book Market Intelligence. Award calculated among non-luxury shoppers. For more information, visit www.kbb.com. Kelley Blue Book is a registered trademark of Kelley Blue Book Co., Inc. -----Automaxx Pleasant Grove-Utah Countys Only UN-Authorized Jeep dealer! --- All vehicles come with a 12 month/12,000 mile Powertrain WARRANTY for your PEACE of MIND! --- Winner of the 2018 and 2012 Quality Dealer Award in Utah and in business since 1998. ---Find us at 205 E. State Pleasant Grove UT 84062. Open 10am to 7pm Monday to Saturday. Or call 801-679-6688! !